No more hair raining on your parade. Hair fall can be pretty concerning to many of us. 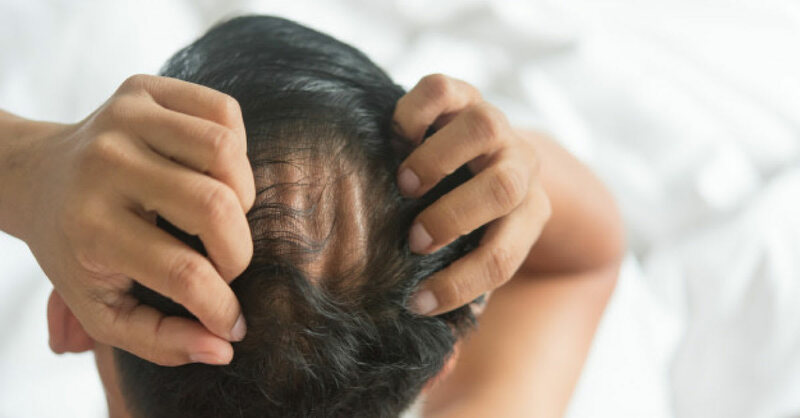 Before you stress out (remember: stress is a potential trigger, after all), understand that there is a difference between hair fall and hair loss: excessive hair fall (more than 50-100 strands) is usually a temporary occurrence that comes as a result of some sort of stress to the body (e.g. Weight loss, medication, worrying about hair shedding) that causes hair damage and breakage. Meanwhile, hair loss happens when hair is unable to grow and requires medical treatment to fix. Treating excessive hair fall is a little simpler because things usually start to improve when this stress is relieved - achievable by changing up your diet, exercising or trying nourishing hair products to keep your scalp and hair healthy. Take a look at some of these below. Nioxin is a pretty well-known brand when it comes to dealing with hair fall. System 1 is the first step of its 3-part system, and is specifically meant to cleanse the scalp of sebum and other environmental debris that could potentially be holding back hair growth. Besides that, it also strengthens and amplifies the texture of each hair follicle, increasing overall fullness and volume while equipping it with enough thickness to protect against breakage. While dandruff may not directly cause hair loss, the act of scratching the scalp can cause breakage and hair fall. This award-winning shampoo from Paul Mitchell contains nourishing ingredients like natural tea tree oil, lavender and peppermint, which not only free the scalp of dirt and oil, but also do so without taking away needed moisture from the hair and scalp. That way, dandruff is effectively reduced and the hair is kept looking smooth and healthy. This product is perfect for those of you who are looking for a quick fix that doesn't require lots of waiting around. Briogeo's leave-in spray mask can be used in between washes and heat styling, and has also been clinically proven to have a reparative effect on hair, using the powerful nature of micro-oil beads to strengthen the entire hair cuticle for healthier and more resilient hair, rather than simply coating its external surface for an illusion of softness. Get your hair more attuned to its true state with this ayurvedic oil. Despite being an oil, it is lightweight and doesn't weigh your hair down, nor does it leave it greasy. Besides being able to smooth out frizz, it also quickly absorbs into all parts of the hair (from roots to cuticles and the ends), keeping it healthy throughout and also smooth to the touch. Aa a bonus, it also cools the scalp, keeping you refreshed even in the heat. Sometimes, it's best to keep things simple and just stick to what nature has got to offer. Pura D'or's Anti-Hair Thinning Shampoo uses a 100% Natural Preservative System and excludes the use of potentially harmful chemicals, including SLS, parabens, formaldehyde and so many more. What's left, you ask? Biotin and argan oil, mixed with a variety of nourishing herbs as well as aloe vera and Red Korean Seaweed, all set to keep hair fall to a minimum. The strong antioxidant effects of Vitamin E can do amazing things to damaged hair, which is partly what makes this product a good choice for those prone to hair fall. With a clean formula that is 100% herbal-based and exclusively chemical-free, this cream uses high quality plants, herbs and enzymes to restore hydration to the hair, strengthening it to prevent breakage and brittleness. Hair tonics aren’t just a thing of the past. The Yanagiya Hair Medicated Hair Growth Tonic gets blood and nutrients flowing to the scalp to encourage hair growth. Made from the essence of natural organic plants, this product gives hair the moisture it needs to be kept healthy and reduces the occurrence of hair thinning and damage. At the same time, it also eliminates dandruff and excess oil, keeping your scalp clean and fresh. Castor oil is possibly one of the best ingredients to help with hair fall as it is extremely nourishing and full of hydration. This particular serum is as versatile as it gets. Besides improving and strengthening hair texture, it can also be massaged into the scalp and skin to balance out excess oils and reduce the amount of debris and sebum hiding in the pores. It can also be applied on the brows to encourage growth (Cara Delevigne who? ).